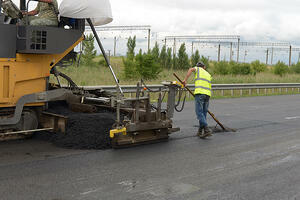 According to the Bureau of Labor Statistics, 962 workers were killed at roadway construction sites from 2003 to 2010. Of those 962 deaths, 143 were caused by a vehicle or mobile equipment in reverse. The National Institute for Occupational Safety and Health (NIOSH) recently issued recommendations to prevent these types of accidents. In addition to complying with all applicable regulations for worker safety and traffic control, NIOSH recommends the following best practices for preventing backover injuries on construction sites. Employers should develop operating procedures that minimize the work to be performed near vehicles. Equipment should be designed to minimize blind spots and with proximity warning systems, such as alarms and beeps. Workers should wear high visibility apparel, especially at night, and be aware of equipment paths at the site. Design sites to minimize backing vehicles and equipment. Ensure a spotter is used whenever a driver needs to back up. Ensure daily communication between prime and subcontractors to ensure everyone understands the traffic flow and any changes are communicated in a timely manner. Channel vehicles and equipment away from workers using highly visible reflective barriers, barricades and cones. Install signage to help workers on foot avoid traffic zones. Ensure that vehicles are properly inspected and maintained in safe operating condition. Install collision avoidance or proximity warning systems on construction vehicles. For a full copy of the report, click here.